We would be happy to send you a random sample of this product. To make the request, please contact customer service at 1-844-66-PROMO or use the Contact us! chat box at the bottom of the page. The 10'x10' Full Back Wall Custom Logo & Color Promotional Tent is a must have for your next job fair or trade show event and will have all noticing your booth. FREE SHIPPING on all orders for this item! Full-color dye sublimation on the entire canopy takes your imprinting to a whole other level! Get your booth noticed with customized tents, personalized with your company colors and logo. 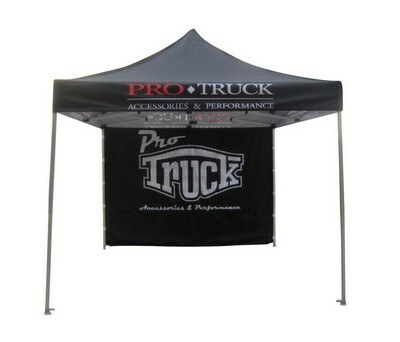 These freestanding tents from Promotion Pros are ideal for trade shows, festivals or downtown event booths, protecting you from the heat of direct sun and allowing you to present the best your company has to offer. Our custom tents - with open and full backs, half sides, and gazebos – make an impression on visitors and help your business stand out in the crowd. At Promotion Pros, our customizable products are not only fun, but offer serious function as well. We are proud to give you the best promotional products, all customizable to your individual needs and that give your business long-term brand recognition at affordable prices. Minimum number of items in each order: 1 items. Shop Custom Zipper Back Table Covers for your next trade show or job fair. These Table Covers are the ideal promotional solution to make your booth look great. Have your booth looking professional with the custom Stretch Table Cover Throw with Open Back. This table cover is a quick solution for a pulled-together look. Have your booth looking professional with the custom Stretch Table Cover with Zipper Back. This table cover is a quick solution for a pulled together look. Click on the location(s) where you want your dye sublimated logo to appear.